Is Flood Damage an "Act of God" or Bad Planning? 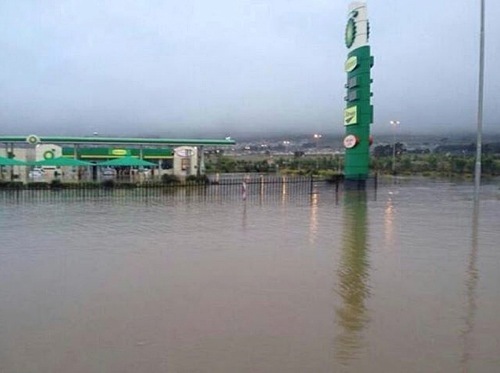 The flooded N2 just outside Somerset West was a veritable river on the evening of 15 November, 2013. As much of the greater Cape Town area and other parts of the Western Cape are still reeling after a night of flash flooding and continued rain, thousands of people are facing the unenviable task of trying to mop up and get their lives back on track. In spite of the fact that the City of Cape Town was already on high alert even before it began to drizzle, and they had warned Capetonians of the impending flash floods they were expecting, the City called an emergency Disaster Management meeting early this morning. And the National Sea Rescue Institute (NSRI) and the full spectrum of emergency services remained on high alert. Photographs of flooded roads, semi-submerged vehicles, and rockslides swamped Facebook and other social media. While the whole region has clearly been hard hit, it seems that Somerset West and Strand took a particularly bitter blow with many houses flooded, cars stranded underwater, residents rescued off roofs, and hundreds of people evacuated from various properties including an old age home, a hospital and a seaside residential caravan park. In addition, local animal welfare organization volunteers were asking for help rescuing animals in distress. With all but one road into Somerset West closed, it was declared a disaster area. My own home – primarily my office – was only a mini-disaster that was drained, mopped and dried within 24 hours. Others are not so lucky, including friends – one of whom was forced to evacuate her home and leave her water-filled car, and another who was forced to abandon her car in the flooded Bridgewater Road – as well as a seriously ill relative who was among the many patients transferred out of the dangerously flooded Vergelegen Mediclinic in the middle of last night. But my question remains, is flood damage (and the dangers that go with it) simply an “act of God”, or does the bad planning of humankind and subsequent all-too-often shoddy workmanship play a greater hand in the scheme of things? While not all floods evolve with the kind of magnitude stories like Noah and his ark evoke, there is absolutely no disputing the fact that floods are inevitable, and with them the inevitability of the damage they bring. Yet people all over the planet persist on building, not only within the 50-year flood-line, but right next to rivers (and sometimes very close to big ones). It terms of human nature, this is probably because most people either don’t know the dangers (or even know about) the 50-year flood-line, or they simply don’t believe that something that is perceived to happen could in fact be a real threat. In its general guidelines for Disaster Risk Management, Flooding published on its web site, the City of Cape Town draws attention to the fact that flood plains along rivers within its area of jurisdiction may have water levels that rise not only to the 50-year flood-line, but also to the 100-year flood-line, “creating a danger to those within those areas”. While the 100-year-flood-line is only thought to be reached once in a century, when it does happen, the consequences will be dire – because nobody (much) cares or pays any attention to this possibility. In its guidelines, the City also talks about “flash floods”, explaining that they happen when “intense thunderstorms result in large quantities of rain into step or urban watersheds in a short period of time”. In another document posted on the Internet that appears to be a recent collaboration between the NSRI, Surf Lifesaving and the Inflatable Boat Organisation, the Somerset West Flood Disaster Action Plan is a largely pictorial assessment of the dangers of the Lourens River when it floods. It is of course this very river (incorrectly called the Lourensford River in numerous current media accounts) that caused the devastation suffered by Vergelegen Mediclinic and other nearby properties. But it doesn’t look as if the high risk areas were correctly identified. Follow the link and look for yourself, cross referencing our Google Map below. 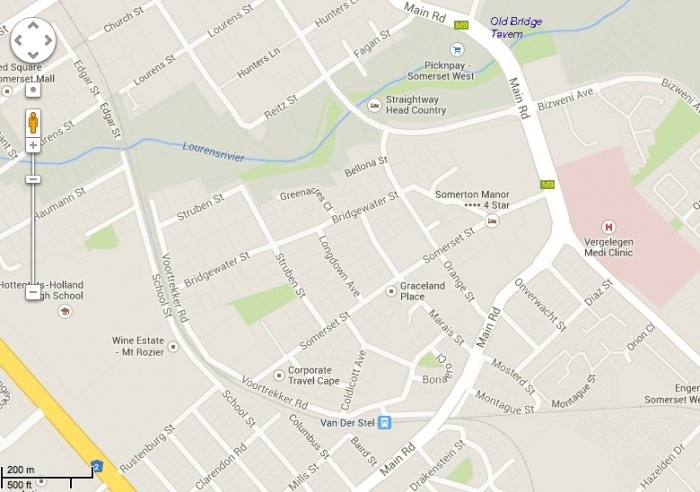 It is interesting that while Vergelegen Mediclinic (shown with an H in a pink block on the righthand side of the Google Map) was disastrously flooded, Old Bridge Tavern in Main Road, right on the river next to South Africa’s second oldest bridge, wasn’t affected at all. Bridgewater Street was totally flooded. Similarly, while the City embarked on a major plan to widen the Lourens River a few years ago, in anticipation of a 50-year flood in 2013 or 2014 (in the area that winds past Pick ‘n Pay, see map above), they were clearly unable to predict that the river would break its banks and change its course much higher upstream, and head straight towards the hospital in November 2013 … breaking its doors with the huge power of the water, turning corridors into surging water courses. That’s what seems to have happened. 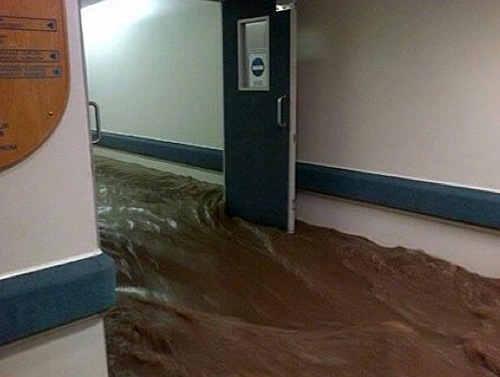 Stormwater surges down a passage at Vergelegen Mediclinic at the height of the devastating storm on the night of 15 November 2013. But there are still many questions that need to be answered, one of which is: Was this a 50-year flood? And another: If it wasn’t, could even worse flooding be in the pipeline? Cape Town and its surrounding areas – Somerset West being one of them – gets lots of rain, year in and year out. But less than three months ago, on August 28, 2013, the Lourens River broke its banks and smashed into the very same mediclinic. The force of the water wasn’t as bad as it was yesterday, but it was bad enough for them to have to evacuate some patients and to close some parts of the hospital. Clearly the City and emergency services can’t predict what might happen in the future, looking forward, but something must be done. This kind of thing should not be allowed to happen again. 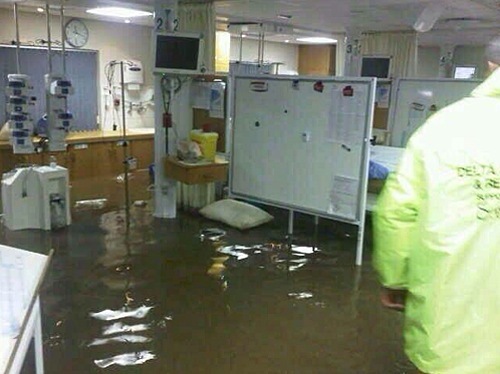 A ward at Vergelegen Mediclinic totally awash. Apart from dramatic damage to property due to flash flooding, as the City’s document points out, localized flooding is another danger. This will often occur inside buildings that have not been constructed correctly and that are not waterproofed properly. At very least, these building will leak! 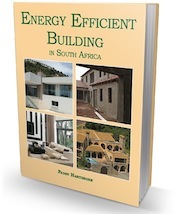 South African National Standards (SANS) are more specific (SANS 10400 in particular) in terms of how to prevent leaking and internal flooding, giving guidelines that will ensure that all buildings are waterproofed from the foundations up to the roof. Of course it’s not enough to assume that your building contractor will do this, or that when you buy an existing house that it has been done correctly, if at all. The fact of life is that in spite of all the bells and whistles put in place in our legislation, substandard building occurs all over the country. When a surging river whacks into a building (like the Somerset West Mediclinic), there’s not much that regular waterproofing is going to achieve. But if a huge storm whips up rain, hail, even the surging tide of water that municipal storm drainage can’t handle, then your home (or hospital for that matter) should be able to withstand it. On our this website, we get hundreds and hundreds of queries from home owners and tenants wanting advice, quite often about issues that relate to leaking roofs and stormwater drainage from neighboring properties. More often than not they raise very serious problems that occur with normal rain. Flash floods are not something they regularly contact us about; but in the event of flash flooding, these properties would be hard hit and certain to suffer major damage. I’ve lived in many rented houses over the years that have sprung leaks. Most of these have been the result of “flat” roofs that have either not been correctly constructed, or that have not been well maintained. My current home doesn’t have a flat roof, though it does leak in places, and yesterday when my office was flooded, I discovered that this time, the fault was even more basic: no damp proofing course in the wall. After mopping water that had flooded through the garage, and stemming this, the water continued to flow – through the wall – and down the wall. To make it worse, the water flowing down the road was damming, because the stormwater drainage system in this part of the town is totally inadequate. To answer my own question: while floods may be an act of God, there’s a whole lot that we can do to make sure that our homes and other buildings remain safe, and to ensure that we take good solid steps to minimize damage to buildings and dangers for people and animals. Where can one get flood line information online? I doubt if you can! Your local council should have this information – or an environmental organisation. Hi there. I wonder if anyone can help me. Is it legal to build in the 100 year flood line, I know that it is not allowed in the 50 year flood line. And if you can please refer me to any regulation / legislation / advisory body / act – anything that has this in writing & not only as an informal “advice”. Secondly if you go against “wise advise” and do build within the 100 year flood line anyway … is this covered by normal home insurance? Thank you so much! Wendy the local authorities keep allowing building within flood lines, and as far as I know it is only bylaws that prohibit it… so if they decide you can, who is held accountable? As far as insurance is concerned, all you can do is read the fine print. Usually an act of God will NOT be covered – and that would apply to floods. Sorry I can’t be more helpful. Hello, I just want to inform all that the disaster plan referred to Disaster Risk Management, Flooding was a draft document prepared by Neighbourhood Watch. This document was a draft submitted to Disaster Management to ensure proper procedure and cooperation was put in place. The evacuation of the citizens was primary for us and we identified the Vergelegen Hospital as a probable flooding area prior to the first flood. We were hesitant to publish any such information as we had no Engineers report or had any insight into risk areas from City Engineers. I am afraid that our fears unfortunately came true and some Neighbourhood Watchers worked for 40 hours nonstop to evacuate, transport and fill sand bags to assist in the flooded areas. In the plan you will see very little data for the Bizwene area as we have hardly any Neighbourhood Watch in that area and no historic data was available to us. (This is by the residences own choice.) The town rallied to assist and we thank each volunteer for their tremendous effort. The hospital was evacuated by paramedics, Vergelegen staff and Neighbourhood Watchers. Other areas in our town that were effected was Sir Lowry’s Pass, Faure, Bizweni, Bridge Water, van der Stel, HHH School, Hillcrest and many more. Thank you for publishing this article and we trust this will assist in getting a proper plan in place. Thanks for the update John. I did realize that this was a draft document of sorts, but referred to it as it is evidence of concern that there has, for some time, been a disaster just waiting to happen. Please update us regarding action that hopefully will be forthcoming, if only after this devastating event. My sympathies are with you John. I don’t think much water followed the expected flow routes – either from the Lourens River or the storm water drains! Too many people affected. Unfortunately, it seems to me that the only solution to the problems that have been created by the failure of various Councils over the years, to curb building within the 100yr flood plain, is going to be the canalize all the rivers and streams. And unfortunately, this will increase the risk of flooding as well as the speed of the water, which will increase the amount of damage downstream. And at present developers / planners can do just about anything upstream without being held accountable for the downstream effects they create. Never thought about it like this. Very informative and interesting. Thanx for sharing. Will you please forward it to my email address? Many thanx. Done! Feel free to pass it on to friends, but please give them the link to our website. Thank you. Quite correctly, one should never build in a flood plain. Of course, there will always be the exceptional circumstances. The flooding in Brisbane, Australia showed that up. Unfortunately, the pressure of population and property prices will always tempt people to build on flat (flood prone) areas. However, building public facilities on flood prone areas is criminal. These are meant to be havens of refuge. Also, storm water drains may be quite adequate, but their design usually does not take into account the effect of rubbish floating into the drain and so clogging it up. Chris we have been told (unofficially) by Council employees that the storm water drains where we live are totally inadequate – largely because of a very big upmarket housing development in Lourens Road (upstream from where the river of the same name broke its bank in August and again on Friday night), that increased the number of inhabitants in the area dramatically. Their stormwater floods down towards us and every time there is a heavy rain, houses in our area (which is about 1 km from this development) are flooded. The same applies to the sewerage system, but that is currently being upgraded because of health issues.